At Sturbridge Yankee Workshop, there have been many new additions to our Website Exclusive assortment. Customers can look forward to even more great products and gift ideas in the coming weeks this holiday season. 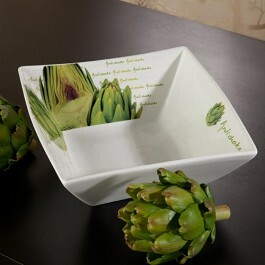 Today we feature a selection of our recently added, Kitchen Accents, that are perfect for adding a touch of festivity to your tabletop decor. 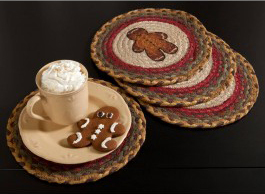 Pictured here to the left is our Gingerbread Man Jute Trivet, available now for $6.95 each. It’s none other than your favorite holiday cookie proudly displayed in the center of the 100% braided, jute trivet. Trivets are ideal for protecting your table surfaces from hot dishes or tea kettles, and they’re a great way to bring color into your kitchen and dining spaces. On a similar theme, we also have a Gingerbread Cookie Recipe Hot Pad. For the low price of $14.95, this hot pad is filled with a fragrant vanilla and shares artwork from Maine artist, Harry Smith. The front of the hot pad details a recipe for gingerbread cookies and therefore makes a nice gift idea too, perhaps for the baker in your life. 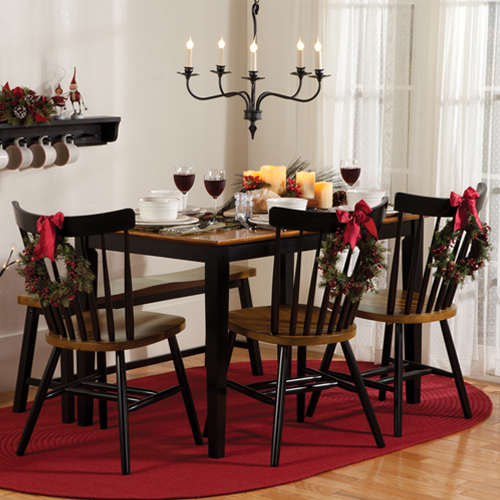 Entertaining becomes more common place this time of year, so don’t forget your tables when decorating. Having a fantastic table centerpiece can bring the decor of a room together and creates an inviting environment for your friends, family and other guests. Shown here to the right, are two options for 72″L table runners at Sturbridge. On the top, both kids and adults alike will enjoy the charm of our Snow Friends Table Runner. Snowmen are fun because they work well throughout the entirety of the winter months. Boasting knotted red fabric on either end, this runner is cheery in its color and appeal. 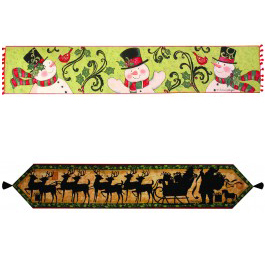 Next up, is our Santa’s Sleigh Ride Table Runner, pictured on the bottom. Framed with holly berry and trimmed with two black tassels, all eight reindeer are here on this Christmas Eve Night. 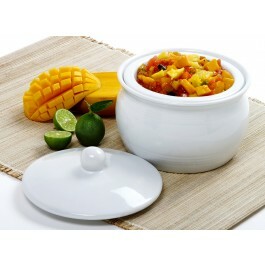 Its silhouette imagery adds a classic look to your tablescape. 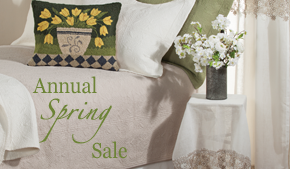 Both new table runners are designed by Susan Winget and are available for $34.95 this season. All of the products mentioned here are made here in the USA. ~Browse more Holiday & Christmas Kitchen Decor at Sturbridge Yankee Workshop today.